(Spark of Hope, 23). Always three steps ahead, the Grand Admiral enters every battle fully prepared for all of his opponent’s moves. 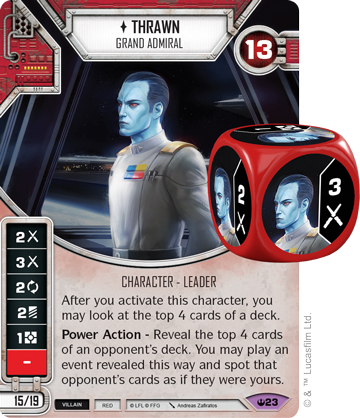 Thrawn is a Red villain character who gets a view of the top four cards of your opponent’s deck every time he activates. This ability provides valuable information, especially for Thrawn’s Power Action, which allows you to use an event from the top four cards of your opponent’s deck as if it was in your hand. Not only will this deny your opponent an important event, it also lets you use their powerful abilities as your own. (Spark of Hope, 36) upgrade, you can wait for your opponent to draw the revealed cards, then use Mastermind’s special to discard the most important one from their hand. 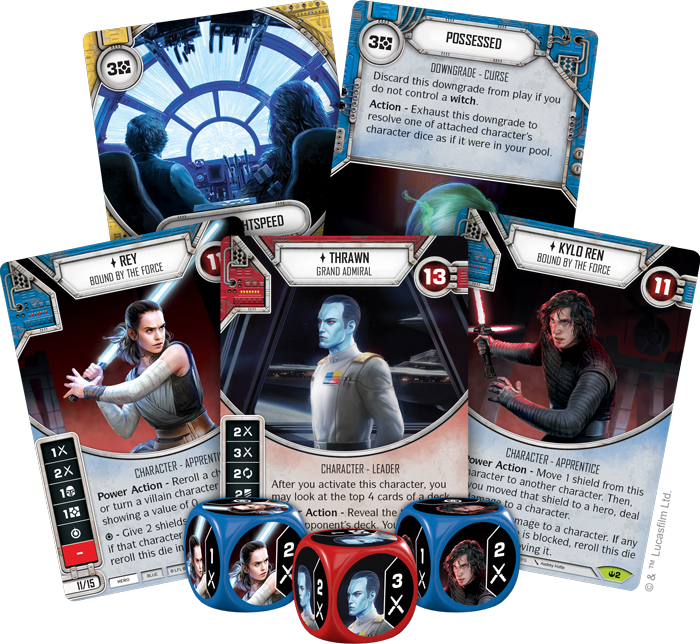 Picking apart your opponent’s strategy and the vital pieces of their deck is powerful, and it is essential to Thrawn tearing apart his opponents, piece by piece. (Spark of Hope, 31) costs an extra resource over Mastermind, it also lets you remove your opponent’s cards while gaining a distinct advantage. By using Cultural Record’s special, you may remove a card from your opponent’s hand and then gain a resource or remove a die every time a copy of that card is played. 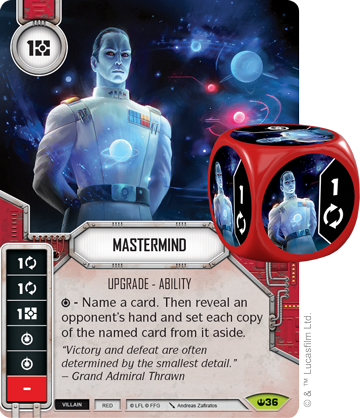 Through gaining a deeper understanding of your opponent’s tactics and resources, you can turn their tools to your own advantage with Thrawn and his unique set of supports and upgrades. (Spark of Hope, 57) special ability is one of the most defensive in the game, allowing you to give a character two shields, then rerolling Rey’s die if that character has three or more shields. 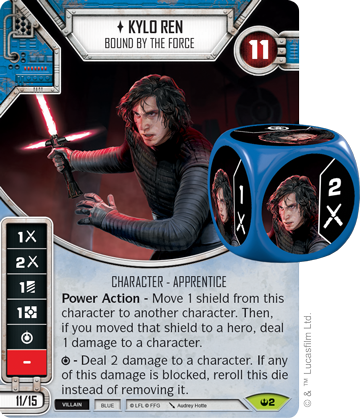 With two melee damage sides, Rey can quickly go from providing cover to battling a foe. Furthermore, her Power Action lets you to reroll a character die, or turn a villain character die to a side with a value of zero, most likely a blank. 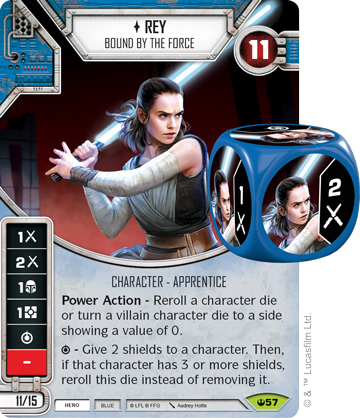 This new version of Rey is undeniably versatile, helping you to mitigate your opponent’s dice, protect your characters, and defeat your opponent’s forces with melee damage. set up this interaction with Kylo’s Power Action, which moves one shield from him to another character, and then deals one damage to a character if the shield was put on a hero. (Spark of Hope, 119) can be established. 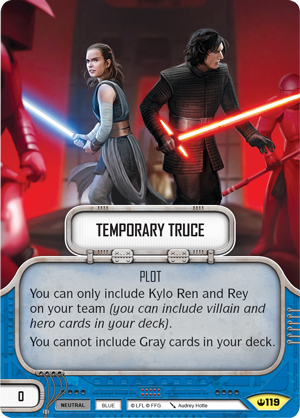 This zero-point plot allows you to create a team exclusively with Rey and Kylo Ren, whose elite versions conveniently add up to exactly 30 points. 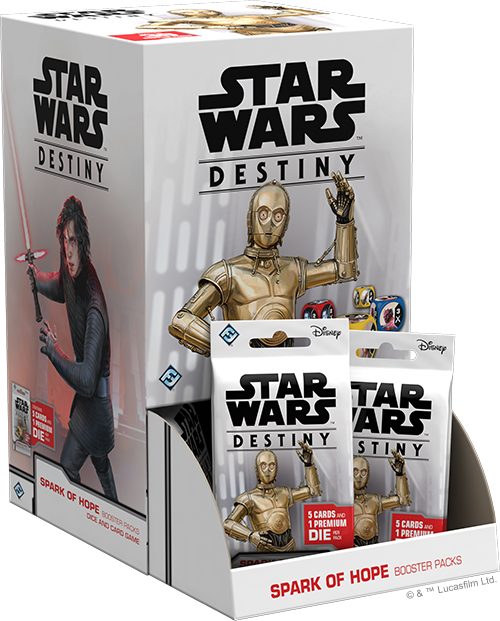 Your deck can also include both hero and villain cards, but the young Force users will have to rely on Blue cards to achieve victory, since Gray cards cannot be included in your deck. While Spark of Hope expands on the themes introduced in Convergence, it also introduces exciting new mechanics, including the game’s first diceless characters! These characters often have a small point cost, can still be attached with upgrades and downgrades, while also providing some kind of bonus when they are activated. 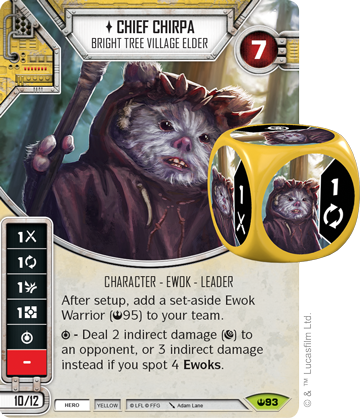 (Spark of Hope, 93), you can even add an additional Ewok Warrior to your ranks! This means your team can consist of Chief Chirpa and six Ewok Warriors, or an elite Chief Chirpa, five Ewok Warriors, and a plot! While individually these warriors may struggle, working as a tribe provides plenty of advantages. 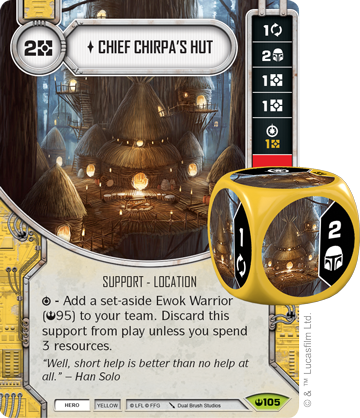 Chief Chirpa’s special ability is more damaging when you spot four Ewoks, and the indirect damage these warriors can pump out becomes intimidating as you activate more and more of them. (Spark of Hope, 107), which can be transferred from character to character if used with a team of Ewoks. 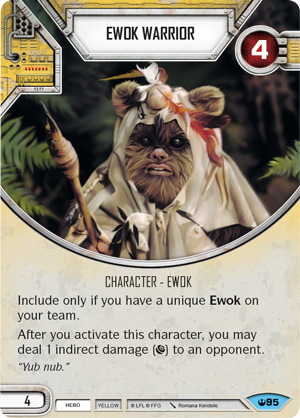 (Spark of Hope, 105) lets you use your resources to add additional Ewok Warriors to your team! The Ewoks may be underestimated, but with pure numbers can overwhelm their foes.